Saving money. It’s the key to building any real wealth. 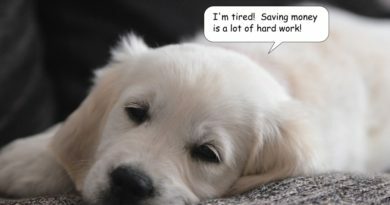 But diligently saving money over the years it takes to reach financial independence isn’t easy. It takes years of steady saving, and some serious dedication. One of the easiest and most controllable ways to save money is by simply cooking all your meals at home. Many people attempt to do this with some regularity, but within a few months many fall off the “cooking at home” bandwagon. Why? Long term consistency is hard, and preparing food at home takes considerable work. Maybe it was a rough day at work, or maybe you simply didn’t have time to cook a meal from scratch. There’s always a really good reason, and after you’ve fallen out of the habit it’s easy to tell yourself that you’ll start again…tomorrow, next week, or even next month. It’s completely understandable why families commonly rack up thousands of dollars per year in restaurant spending — It’s soo easy to trade that extra little bit of money to have someone else prepare and serve you food. So how do families like mine go years without eating out? How do we stick with it year after year without fail? Don’t we get tired of cooking? 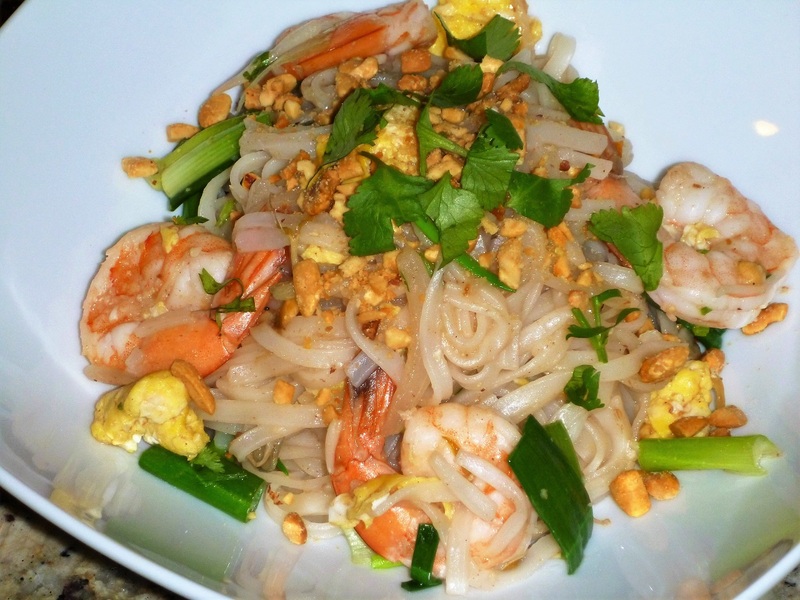 My homemade Shrimp Phad Thai. Who needs to eat-out when you can make great food like this? It all comes down to building frugal habits. Our family didn’t start out being so frugal…it’s a habit we built-up over time. Initially we had the same spendy food habits as everybody else — we ate out all the time. We went to restaurants about once a week, and got takeout at least one other night of the week. Lunches were typically purchased as well. Combined, Mrs. Tako and I spent an additional $300-$500 per month eating food prepared by someone else. Money we could have saved. It was a terrible habit we needed to break. We knew we needed to form better financial habits, so we started with small changes. Instead of sitting in a restaurant and soaking up all that wonderful ambiance, we simply ordered takeout. Eating was no longer the same “experience”, but we still had the same good food (just not in the restaurant). As a result, the money saving process started. Over time, we found ourselves ordering less — fewer appetizers, smaller portions, smaller tips, and fewer drinks (or no drinks!). The bill amounts started falling. It was actually a very easy transition. This went on for maybe 6 months, and we realized that picking-up takeout actually turned into a chore. Someone had to order, drive to the restaurant, pay for the food, and then drive back home again. It took time, and wasn’t terribly fun either. Four times a month turned into three times a month… which eventually morphed into once a month. Now, we go multiple months without a single takeout order, and I can’t even remember the last time I sat in an actual restaurant. 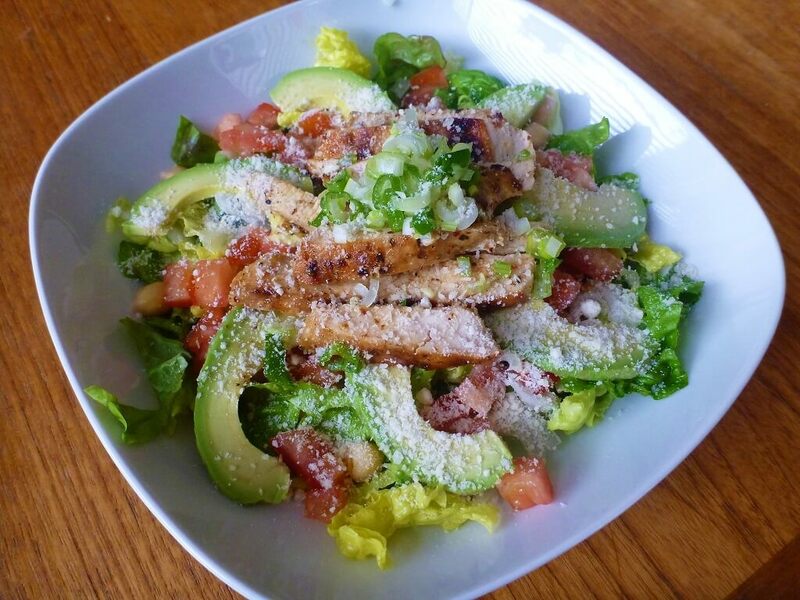 Bbq’ed chicken salad. It would take longer for me to drive to a restaurant, get seated, and then order, than it took me to prepare this simple and delicious meal. Part of cooking more at home is about learning to be a better cook. Why? If you can’t cook decent food, you won’t want to eat at home. Don’t kid yourself, becoming a good cook isn’t a skill people are born with — it takes practice. Lots and lots of practice. Good thing you’ll be getting plenty of practice once you stop eating out so damn much. Part of being a good cook also means cooking something you actually want to eat. If all you ever cook is instant ramen and macaroni, you’ll quickly tire of that menu. Instead, cook food you have a passion for! 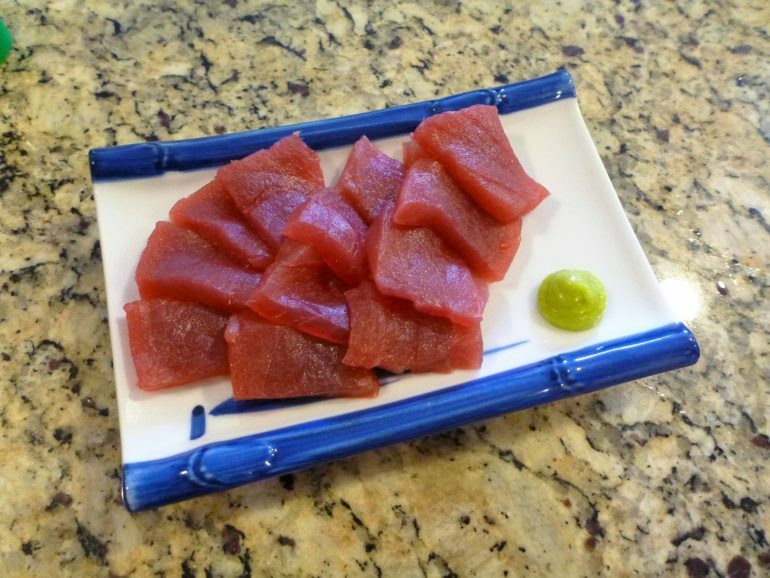 Mmm… sashimi! No mac & cheese here. If you’re preparing food at home all the time, you might as well eat the food you really like. Spend the time (and money) to make really delicious dishes. Don’t be afraid to spend on high quality ingredients, fresh herbs, or special sauces — You’re going to be saving a ridiculous amount of money by not eating out. Quality ingredients make a huge difference in preparing great meals. 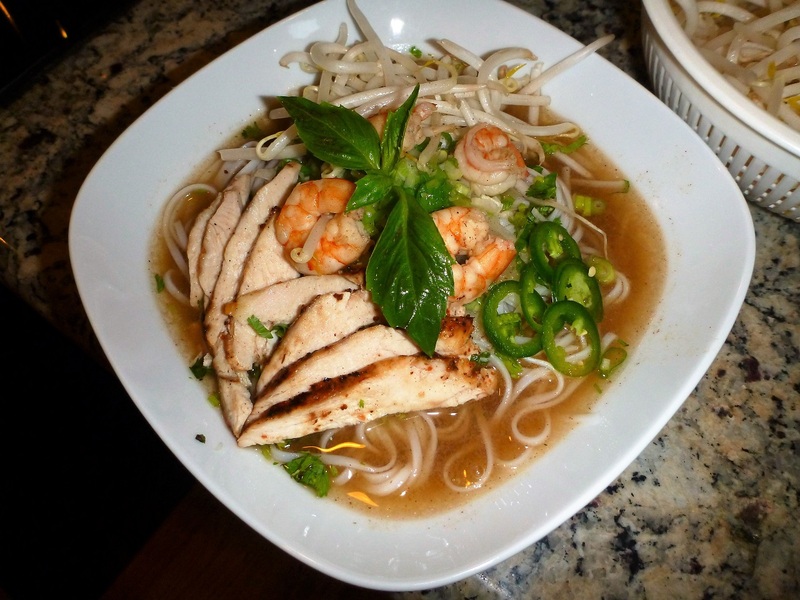 My shrimp & chicken pho recipe. Absolutely delicious, yet made for only a few dollars. Keep cooking interesting too — don’t get stuck in a rut cooking the same 5 dishes over and over again. Constantly expand your culinary possibilities by trying out new dishes and new techniques. Don’t be afraid to attempt foreign cuisines and more complicated dishes either! 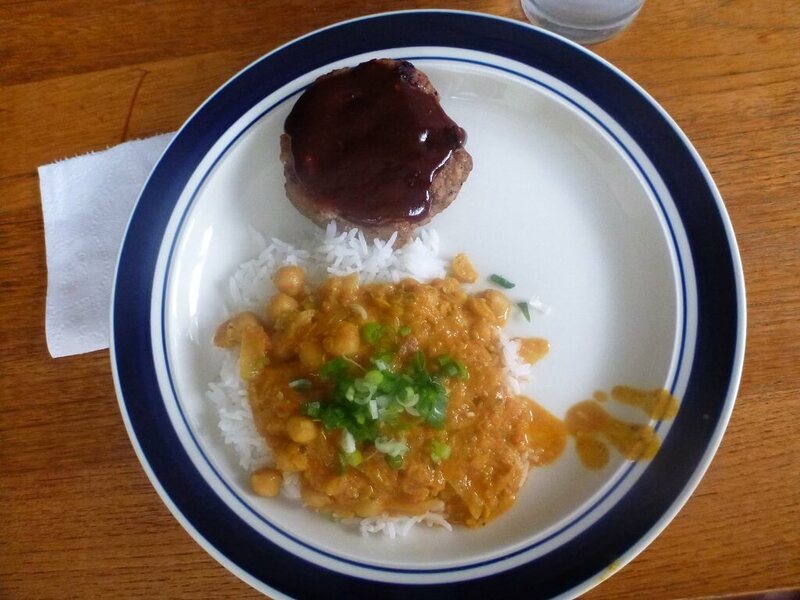 Japanese “hambagu” and a “chickpea and lentil” curry (inspired by Mrs. Picky Pinchers). Of course, everybody can get tired. Sometimes life just gets too busy for cooking meals from scratch. That’s why it’s important to plan ahead. The solution is simple — prep meals ahead of time for when you’re having “one of those days”. Rather than cheating, meals become a matter of reheating food items you’ve already prepared. No need to buy food from the nearest fast fat food restaurant, just reheat! This spread for my kids took about half an hour to prepare. The gyoza, the corn, and the udon were all frozen when I started. All other items were cooked and in the fridge. I merely threw this ensemble together at the last minute. An easy meal on a night I wanted to be lazy! Our family typically makes a larger batches of our normal meal, then portions it out into air-tight locking glass containers like these. We’ll then pop them into the freezer. On a busy night (or a lazy night), a simple re-heat makes meals easy. 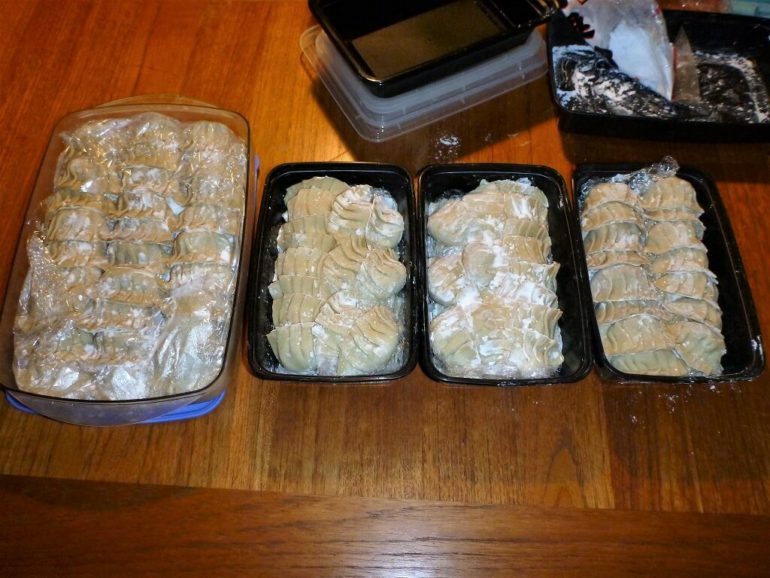 Homemade gyoza. Prepared and ready for freezing. We’ll put this in the chest freezer and then pull-out what we need for a quick re-heat on “lazy nights”. Expensive condiments like salsa we also batch-make and freeze. My roasted salsa recipe is out of this world good, yet typically costs less than $1 per pound. What’s that? You don’t have any freezer space left? I highly recommend getting yourself a chest freezer. They’re cheap, highly efficient, and can store tons of prepared meals. I even wrote a post about how much I love my chest freezer. It’s also worth noting — another way to keep the “at home” habit going is by simply sharing the load with your partner. In millennia past, cooking tasks were designated along gender lines — but there’s absolutely no reason why this should remain true today. In our house, Mrs. Tako cooks breakfasts, and I make the evening meal. When one person cooks, the other does the cleanup. 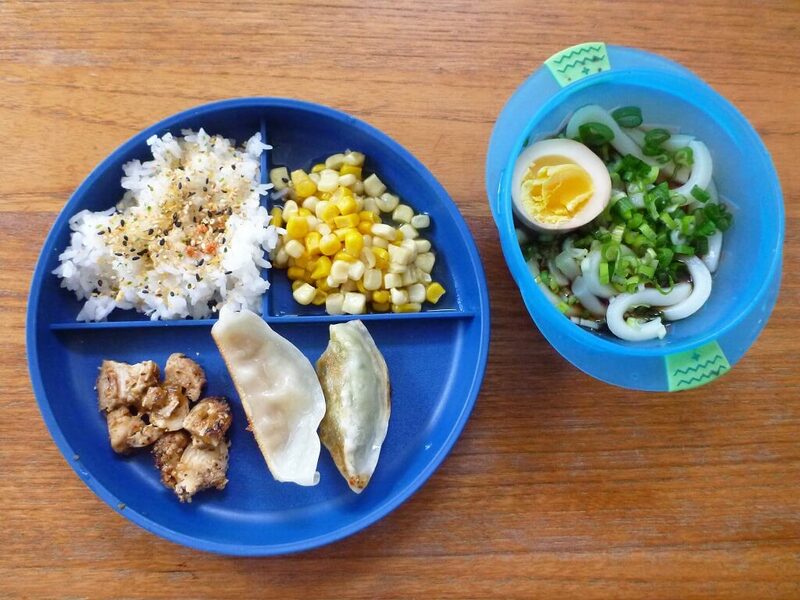 Lunches tend to be individual affairs for us, except on the weekends. 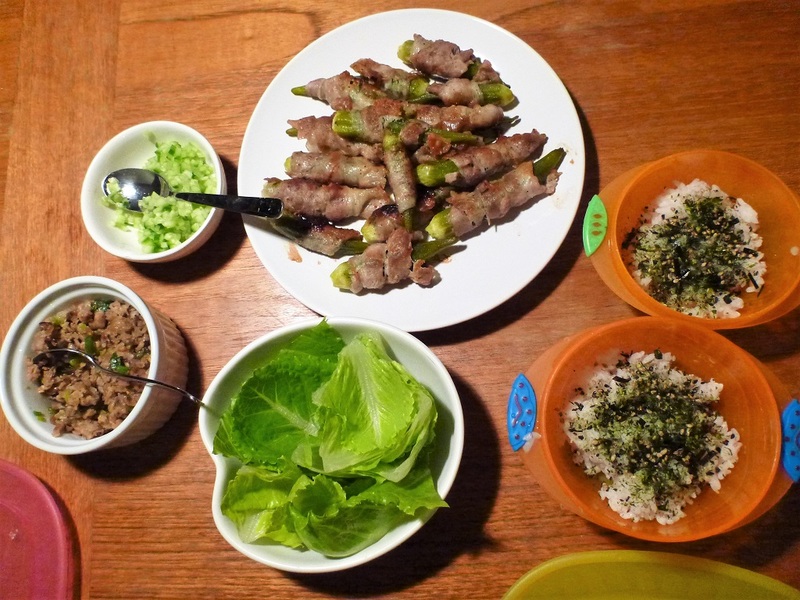 Pork wrapped okra and asian lettuce cups with Japanese furikake rice, prepared by Mrs. Tako. She usually cooks breakfast, so this was a rare treat. While Mrs. Tako is a far better cook than I, we both try to share the load. When one of us is tired or sick that day, the other partner takes over. This might not sound like a revolutionary tip for saving money, but you’d be surprised how frequently I talk with moms who shoulder the entire responsibility of cooking for a family… they all sound exhausted! Most of them are dying for a break. I hope sharing my own culinary journey is either inspiring or helpful for families looking to save some serious money. Stick with it folks! Financial independence is worth it! It’s been over 5 years now since we gave-up eating at restaurants, and I have little desire to go back to that life. Frankly, I can now cook better food than I find in most restaurants … at a mere fraction of the cost. Saving ourselves $400 per month, we’ve probably saved an additional $24,000 of capital to fund our financial independence. While not a huge sum, that isn’t peanuts either. That money, once invested, will continue to appreciate and earn us dividends for decades to come. That’s a delicious treat I can dig into. ← Want To Get Rich? Skip The Buffet! Our family followed a similar process of weaning ourselves off soda. We gradually bought, and drank, less and less. Last summer we bought a Soda Stream, and now, we occasionally make seltzer, or flavored seltzer/soda, but often will just drink water. We occasionally (2-4 times per month) eat out, but it’s a big pain, because we only have 3 restaurants in our town, and anything else is far away. There’s one take out pizza place, so that usually helps us right there. If I could get better at batch cooking! We currently use the Frugalwoods method–buy a bunch of frozen pizzas for when you’re exhausted or get home late! Thanks for an inspiring post. I’m going to try your salsa recipe at my parents’ house this summer–they have loads of homegrown tomatoes! The gyoza recipe is Mrs. Tako’s. I’ll see if she’ll be willing to share it! There is definitely a difference between western Europe and North America. Eating our for us was a treat, something special, we hardly did this when we grew up (it’s also relatively expensive). The States and Canada are so much cheaper for eating our, I can understand why fewer people cook at home. That being said, food is often much better at home (with the occasional exceptions, of course). 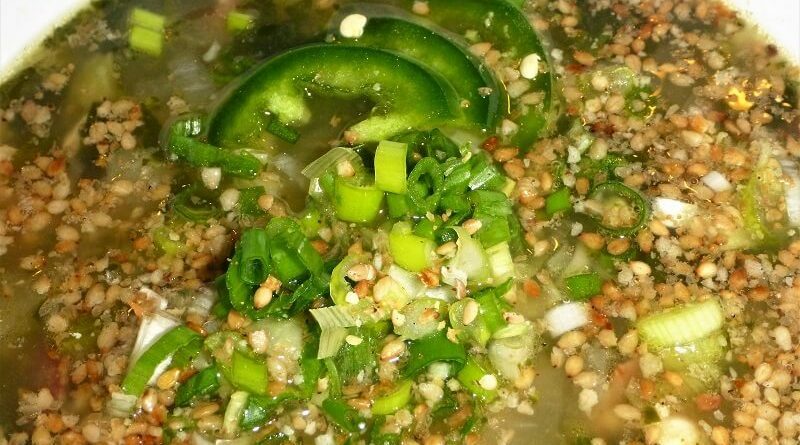 For us the main reasons to cook at home is that you know what you are eating. We try to eat primarily plant based whole foods, to limit the risk of medical issues in the long term. But this type of food is almost impossible to find when dining out/take away, so we have to cook! Completely agree Team CF! When you cook at home at least you know what you’re getting. 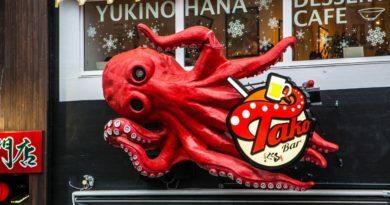 Mrs. Tako has some allergies to certain foods, and eating out was always a gamble! I LOVE this post! I really like the awesome food photos, your transition to not eating out often, and how you shares daily chores with Mrs. Tako. I am transitioning from buying lunch one day per week to only eating home cooked food for lunch when I’m at work. I was about to throw in the towel this morning out of sheer laziness when I checked my email and saw the message about this post. That snapped me out of it! I now have a delicious homemade kale Caesar salad with tomatoes and cannellini beans waiting for my lunch. Far better than a $10 sandwich. (I work in Manhattan, where it’s impossible to find a healthy and delicious meal for the same cost as bringing food from home.) You should add clairvoyance to the list of admirable octopi qualities. Well done, and thanks! So much yes to this! I think keeping things interesting is the key to successfully eating at home. That’s why we try so many out-there recipes (and hope that they taste good!). Freezer meals are also the best thing to have on hand for when you’re either too busy or too lazy to bother with full-on cooking. I’m very impressed with your change of habit. I enjoy cooking at home too, but we still go out a few times per month. The only thing I’m not good at is cooking big batch meals and freezing them. We always cooked enough for 1 or 2 meals and have the left over for lunch. I need to figure this one out. Our freezer is very small, though. It might not work for us. I love how you made this transition! Eating out in the bane of my existence. It’s not uncommon for us to spend much more than you used to in a single month. Renaissance Man, however, doesn’t have any desire to reduce our dining out trips, so it’s a hard-fought battle in my home. I recently heard about Slowly Sipping Coffee’s allowance budgeting. I’m thinking of adopting it for work lunches as a beginning step! Your food looks delicious. I’ve got like maybe 3 dishes down and really need to up my game. Before we started travelling, Wanderer and I would also share the load whenever we cooked. I’d cook and he’d do the dishes or vice versa. Otherwise, it’s just too much work. Not only did cooking help save us money, it also help me lose weight! We could control the portion sizes and what goes into our food and it makes a huge difference. That being said, going out to eat every now and then is really fun! It’s a nice treat once in a while to get out of the house and try something new. I think that’s why I’m so in love with Asia. Eating out is SO much cheaper (even cheaper than cooking in North America) AND the food is healthy. I ended up losing more weight eating out everyday in Asian than cooking everyday in North America. But I can see the benefits of cooking when you have kids and are tied to one city. Definitely makes more sense to cook. It sounds like you saying it’s cheaper to eat-out in Asia than cooking at home. Do I have that wrong? Is it really that cheap? It’s hard to believe! 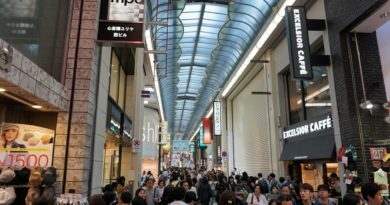 Labor may be cheaper in Asian countries, but it’s hardly free! Yes, it is. That’s why the condo building we rented from Airbnb didn’t even have a kitchen. I asked our host and she says the residents just go out to eat. And with meals costly as little as $2-3, it really was super cheap (this is south east asia, by the way. Japan and South Korea were more expensive to go out to eat). You could probably end up eating for even cheaper than $2-3, but then you’d need transportation to a rural farm or be able to haggle with the vendors in local markets. The groceries stores near the condo were charging more for the groceries than what we spent eating out. How the vendors are able to sell meals so cheaply is because they can grow their own veggies, raise their own animals or haggle at the local market. Also there are just SO so so many vendors, night markets, food carts, that the stiff competition drives the food costs down. Hmm… so the local vendors are vertically integrated. Interesting. Two to three dollars per meal is quite cheap. While I average slightly over a dollar per serving for food, once I add in the cost of energy and water it’s probably well into that $2-$3 range. We don’t eat out very much and realized last year how difficult it was while traveling in Japan to get meals with lots of vegetables and fruit. Fruit in Japan tastes great but is really expensive. A lot of the take out meals were starch based so we made an effort to cook where we stayed which requires some planning when you’re being a tourist. We spent a small fortune eating out and buying stuff in the basement of depaato but hey, the food is one of the main draws of going to Japan. I suspect other countries in Asia have better vegetable based eating out options. You know, cooking and eating at home is a usual thing to do in Russia. People who were born and raised in ex-USSR didn’t have this concept of going out to eat. Of course, sometimes we would go to a cafe or a restaurant but it was for a big event only. Like a wedding, or an anniversary. And my wife is a great cook. Ok, so that pad thai looks legit though, so no wonder you guys don’t need to eat out. For us, we outsource all our food now. Either catering or eat out. We used to cook all the time. I used to buy a ton of chicken breasts from costco and prepare, on Sundays, everything. Stir fry the stuff, steam the veggies (broccoli and cabbage mostly), and brown rice and prepare meals for the entire week. Our lives have gotten to the point though where time is so much more valuable than the small savings here and there. We can always make more money to compensate. It’s a give and take thing. You lose a little money in this area, so you have to compensate in another area, preferably an area where you have more leverage/strength. It’s far easier for me to save $4.8k by cooking at home than to earn an additional $4.8k at a job with that 1 extra hour per day it takes to cook. That math probably holds true for most people, but of course I can’t speak to your situation. Besides, are you *really* saving any time by eating out? Think hard about it. Driving to the restaurant, waiting in line, ordering, waiting for the food to be prepared, waiting to pay the bill… it all takes time. The “saving time” excuse gets thrown around a lot, but rarely is it true. Good point. I think I save the most time with outsourcing (i.e. catering). I order full trays of chicken teriyaki, brown rice, and veggies. Lasts our household the whole week. Just one drop-by. I’m not advising this for everyone. Works for us. Interesting. What you’re describing as catering sounds like bulk takeout. You’ve got me curious — what kind of cost per pound do you realize after taxes and tipping on that food? Don’t know. It’s about $30 after taxes for the tray of chicken. And $17 for the tray of veggies. We most typically cook the brown rice at home. It’s like $15 for a 10lb bag from my local Korean grocery store (so this lasts us quite a while). So probably about $50 a week give or take a few dollars to feed the wife and me. The kid has different stuff he eats. Baby stuff that’s on subscribe & save through Amazon that gets delivered to our doorstep every month. That’s some really good looking stuff you’ve made there. I totally agree that eating out is the way that a lot of people in my generation “waste” their money. It’s much saner and healthier to eat at home, not to mention cheaper. Just the other day, a friend and I were talking about people we know who eat out every meal(3x a day, 7x a week) and how much that must cost. I’m not one to avoid a good meal as my girlfriend an I eat out at a nice place once or twice a week but we limit ourselves to just weekends and cook/make food at home every other day. This saves a lot of money and really makes you appreciate and enjoy the high quality sit down meals(even if they’re expensive). These dishes look amazing! And it only costs a fraction of what a restaurant would charge. Mrs. Hammocker and I recently got hooked on making fish tacos. We buy fish and shrimp in bulk at Costco and can enjoy amazing food 5x more often. Thanks for inspiring us to cook delicious food since this will ultimately save us from going out to eat. Couldn’t agree more with this post. My son actually loves spending time to cook with me. And to be fair, home cooking is way more healthy. We love to cook and freeze a fair bit of food but I am very leery of getting a dedicated freezer. My grandma had one when I lived with here and that is where bad meals went to die. We even found a frozen turkey in there that was older than some of my cousins. How do you keep your freezer from getting too old? First in first out? Skip groceries some weeks to force yourself to eat frozen stuff? Spreadsheet? Never really had a problem with it. We try to continually refresh what’s in there, so most things aren’t that old. If we’re not going to eat something, we simply don’t store it. Chris…this is a fantastic way of looking at this. Hubs and I were both working, raising kids and on top of this I was flipping houses. We got in this habit of eating out all the time. It turned out to be an crazy expense. Looking at it the way you do is terrific.